I was at an industry event representing Bison Transport a few months ago, and I was surprised to hear so many senior leaders talking about Millennials and how they were flighty and didn’t want to work. In fairness, that is a common stereotype. There are many videos, blogs, and memes showing how Millennials are lazy, privileged, and need to be coddled. One of the most popular shots at Millennials is this video. Be warned, the song is extremely catchy! Additionally, this video released to promote a very important cause: ‘Sponsor a Millennial Today”. It was an immediate internet hit. While these videos are clearly humorous, they don’t capture the essence of what Millennials can offer. Personally, I started my career recruiting hundreds of college and university students each year, and I would lead them toward opening their own businesses over the following few years. When I was 21, I was fresh from earning my Bachelor's degree and I moved to Thunder Bay to start my own business. I found office space, hired support staff, and built one of the top branch offices in Canada. I saw firsthand how talented and driven young people are and that lesson has stuck with me. At Bison Transport, we have a thriving sub-culture of Millennials that are rapidly making a name for themselves and advancing. Are Millennials as a group different than past generations? Sure, but let’s not mistake different for bad. Sure, many Millennials sport skinny jeans and beards, but, they prove each day they have a lot to offer and they're eager to carve their own place out in the world. We have also noticed that in many of our interviews with Millennial-aged applicants, we are asked about our Corporate Social Responsibility and culture. These applicants show us each day how aware they are as a generation, and that they want to work for responsible companies and make a difference each day. Check out this very insightful guide about Millennials by Waterstone Human Capital called Waterstone Millennial Report: The Purpose Generation. It should be clear by now that people just getting started in their careers can thrive at Bison Transport. 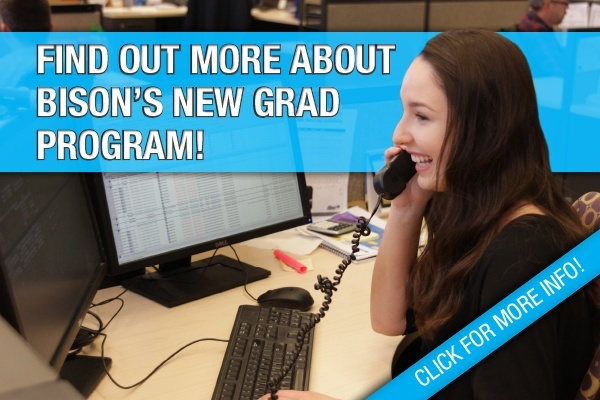 We hire many new graduates through our New Graduate Program. Three such examples are Jason, Jonathan, and Scott. Click on their names to learn about their stories at Bison. Click here to read more about the program and how you can start your career at Bison today!